The Peale Mountains are associated with the Basin and Range faulting and the over thrust belt. The block faulting is not as pronounced as ranges farther west. The range receives little more than 24 inches of precipitation per year and consequently is somewhat dry in appearance. Large stands of pine and fir are interspersed with thick aspen stands, while thick brush fills many creek bottoms. The high ridges are bare of trees. Valley-to-summit elevation differences can be substantial, and sections of the range are quite rugged. This mountain group is made up of five subranges, Aspen, Grays, Pruess, Webster and Wooley, as well as several ridges which could be classified as a subrange of which the Schmid Ridge is the most prominent. There are separate pages for each subrange and the Schmid Range is discussed below. There are a lot of great peaks in this mountain group. Check out Meade Peak and Mount Mansfield for starters. I have added a lot more information provided by Rick Baugher on the peaks in this area including the following on the Schmid Ridge, Wilson Ridge and Pelican Ridge portions of this range. From the ‘wrist’ of the Peale Mountains at the head of Georgetown Canyon, Schmid Ridge is one of the middle fingers that reach north. Neighboring ‘fingers’ are Aspen Range to the west and Dry Ridge to the east. 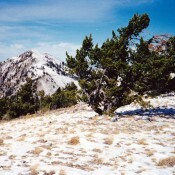 There are 10 ranked peaks along the 15 mile length of Schmid Ridge. All of them are best accessed from the Slug Creek Road which follows the west base of Schmid Ridge for its entirety from Blackfoot River to the crest of Left Hand Fork Georgetown Canyon. Slug Creek is a scenic mountain valley used for livestock grazing. The well graded Slug Creek Road is usually plowed and open to vehicles by May 1. 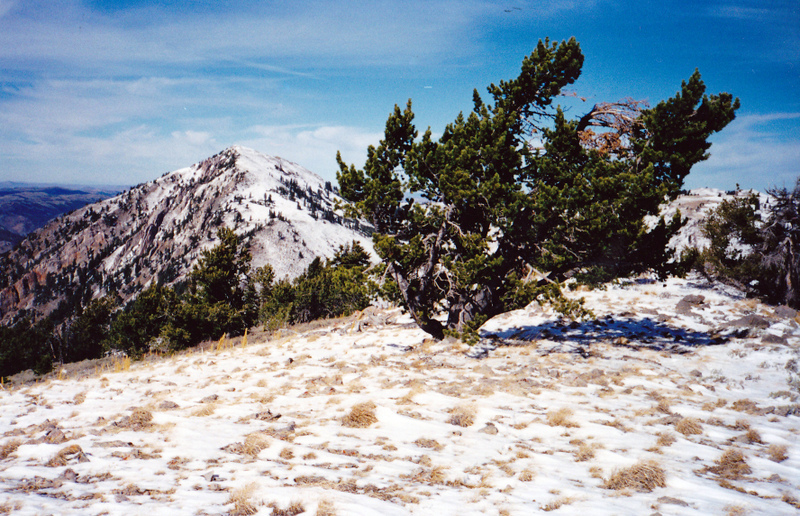 ‘Schmid Ridge Highpoint’, aka ‘Schmidhorn’ rises to elevation 7916′ with a 576′ prominence. Seven of the ten peaks are on public land. Hikers should expect varying degrees of brush whacking on all of them. Schmid Ridge is identified on the 1915 topo maps published by the USGS. It is named for the Schmid Ranch along Slug Creek. Early government surveyors on occasion would name a geographic feature for a local landowner who provided them with help and information. 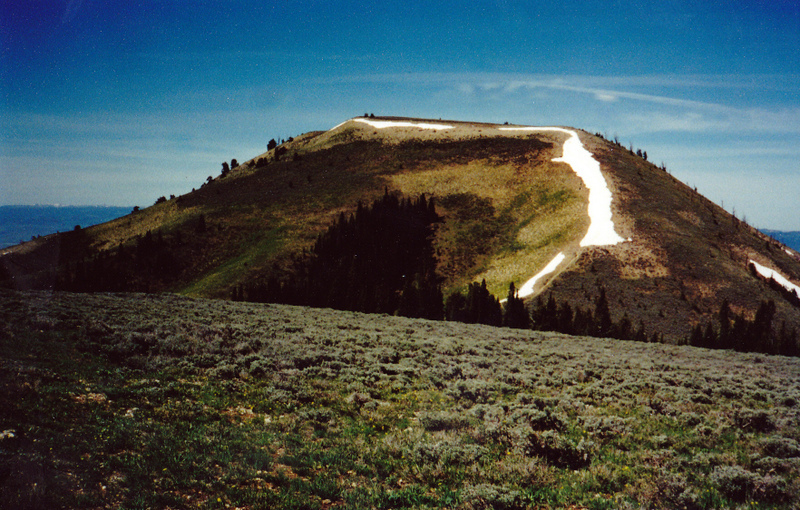 Yet another Idaho peak named Bald Mountain! This one is located in the Pruess Range northeast of Montpelier, Idaho. The view is west from the Home Canyon/Bennington Canyon divide. Rick Baugher Photo 5-30-2001. (Rick Baugher provided the following.) The geologist/geographer George Rogers Mansfield called the mountains bordering the north shore of Blackfoot Reservoir ‘Wilson and Pelican Ridges’. He identified this 12 mile long topographically prominent grouping under the catch all heading ‘Independent Features’. Surrounded by stream bottoms and a lava field, these ridges don’t connect to other mountains. This area can be considered a northwest outlier of the Peale Mountains since the Peale Mountains is a grouping of related features in this part of Idaho. Although not particularly noticeable from most directions, Wilson Pass divides the two ridges. The two track thru this pass, which connects Grays Lake and Blackfoot Reservoir, was constructed in 1858. This was part of the Lander Cutoff of the Oregon Trail, a federal emigrant road that went from South Pass to Fort Hall. There are five ranked peaks here. Limerock Peak 7488’/838′ is HP of the Wilson Ridge section, while Camp Peak 7726’/1271′ on Pelican Ridge is overall HP. Both of these summits were used for triangulation by the USGS in 1915, the year Blackfoot Reservoir became operational. Most of Wilson and Pelican Ridges is on a contiguous block of state land. Sheep grazing is a predominant activity on the brushy SW facing slopes. Best access is on the southwest side. From paved ID Hwy 34 at Henry, drive the graded North Shore Blackfoot Reservoir Road to any desired hiking start point.